Love to cook? What about tasting foods from different parts of the world? We are offering a unique opportunity to explore the tastes and the rich perfumes of traditional foods from North, East South and West African cuisine at the exquisite Jamala Lodge in Madikwe, South Africa. 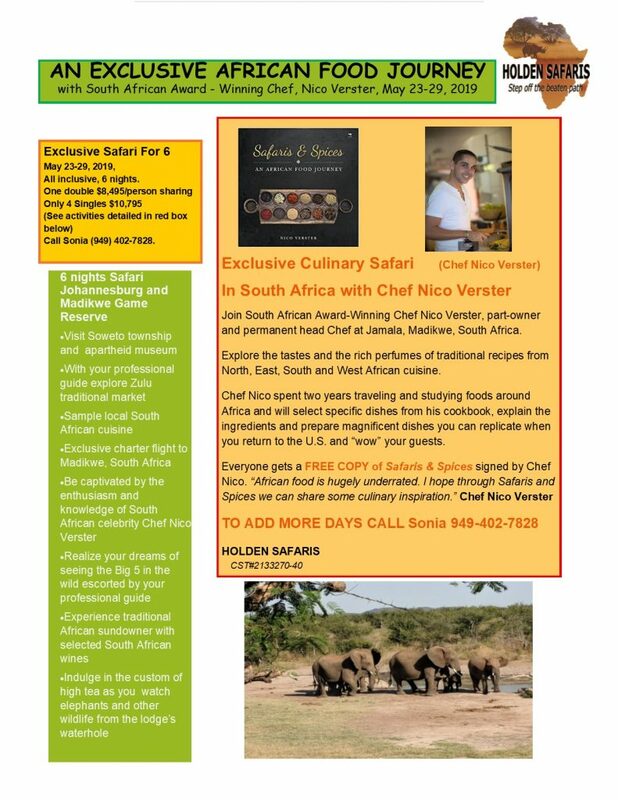 Join us on an exclusive “African Food Journey” with award-winning South African Chef, Nick Verster. May 23-19, 2019 in #Madikwe, South Africa. Call or e-mail SoniaM@HoldenSafaris.com (949) 402-7828 or JimH@HoldenSafaris.com, (949) 500-0094 to reserve your spot.